The homeowner of this family home made it a priority to add extra seating, entertainment, an area for kids garments and even a spot for the dogs. His designer made it happen. A country-style family house located off the beaten path in Meadville, PA —This is the place that Dillon, his wonderful children and two dogs call home. It is a family house, so it is most definitely well lived in and comes with many good memories. Dillon jumped into the remodeling process mostly to increase the amount of seating in the kitchen, but also to update its style and functionality. He found Ellena's website and really took to her designs. A call soon followed. 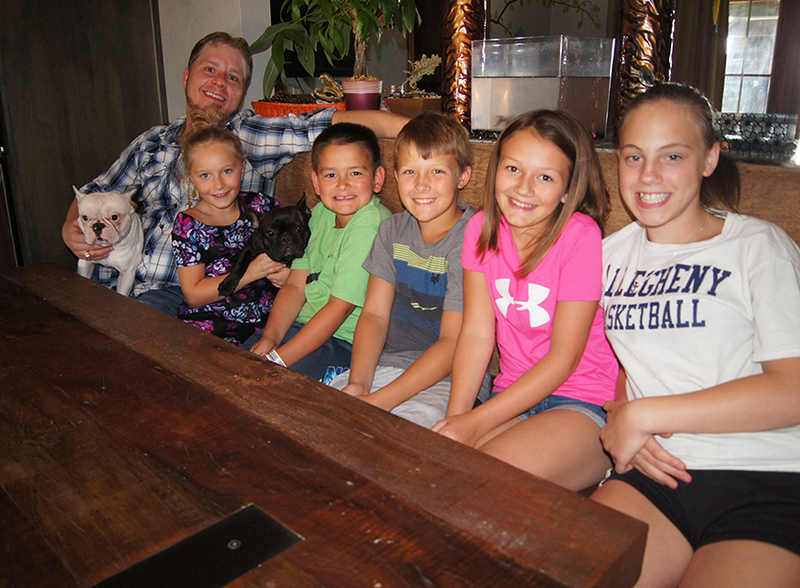 Dillon, his children and their dogs. After the first appointment Dillon had with Ellena, he was sold. In a phone conversation I had with Ellena she told me, "Once he (Dillon) got to see and touch the finishes that Plain & Fancy had to offer, he trusted me." The relationship between homeowner and designer is a crucial factor in the success of the remodel itself. Ellena is the owner of Kitchen Genesis by E.Rose Design. In addition to earning her Bachelor of Science in interior design from Mercyhurst University, she has also studied fine arts and design at New York University as well as old and new world architecture in London. Sometimes the client wishes to be very closely involved in every aspect of the remodel process, but other times the designer is largely responsible for making most of the decisions. In this case, it was the latter. Dillon made sure to convey the reasons for his remodel to Ellena; improve the amount of seating, update the style and functionality of the space and to incorporate an area for the family pets and an area where the children can store their shoes and jackets. After this he gave Ellena the green light to run with the project and make most of the remodeling decisions. 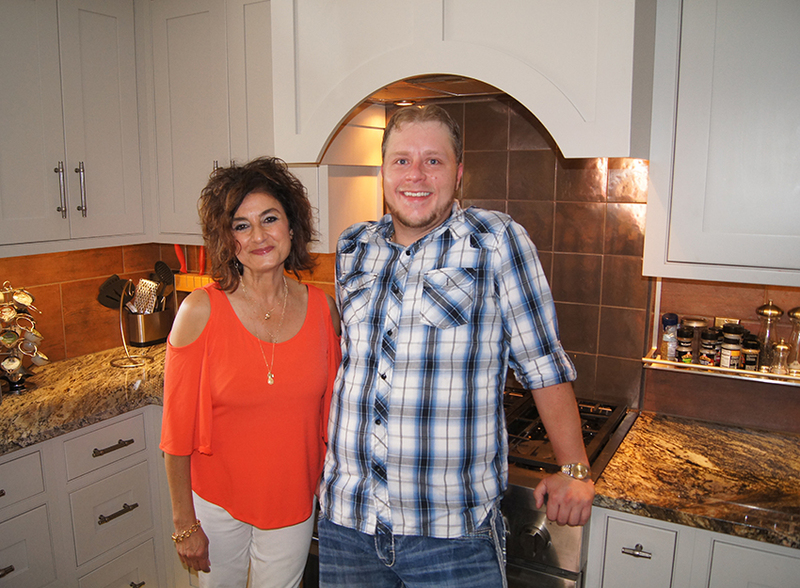 Designer Ellena Rose Gotto, owner of Kitchen Genesis by E. Rose Design, and homeowner Dillon pose for a picture after the completion of this kitchen remodel. Ellena recognized the need for improved seating and made that the primary focus of the remodel. Dillon and his children often congregated in the kitchen, but there was never enough room to seat everyone. Further, the family often entertained friends and needed room to accommodate them, too. In order to achieve the maximum amount of seating space as well as to modernize the kitchen, Ellena chose to give the kitchen more of an open layout. 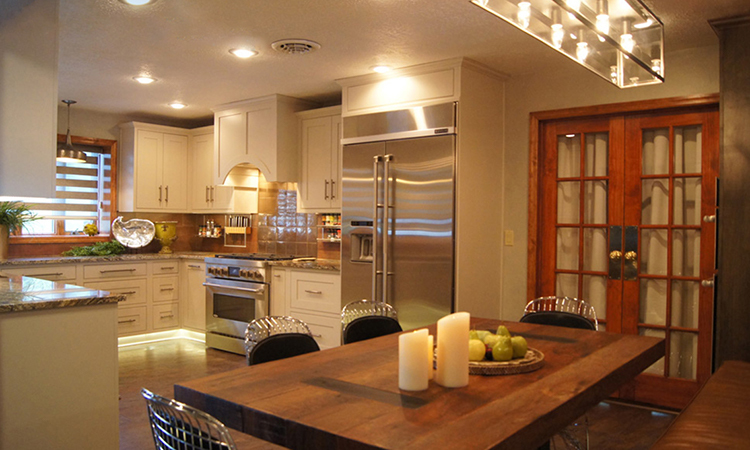 She added a kitchen table with built-in bench seating and an island overhang to increase the amount of seating by 6x. A "before" picture of the kitchen and the amount of seating it offered. After the kitchen was remodeled, between the new table, bench seat and island overhang, the amount of seating increased 6x. Dillon also wanted a space in the kitchen area to keep the kids' shoes, jackets and maybe even backpacks and sporting items. Ellena took advantage of a space that previously was used to store an old aquarium and wasn't optimized for storage. A bank of cabinetry was added to act as a pantry and a gathering area for the kids' items mentioned above. 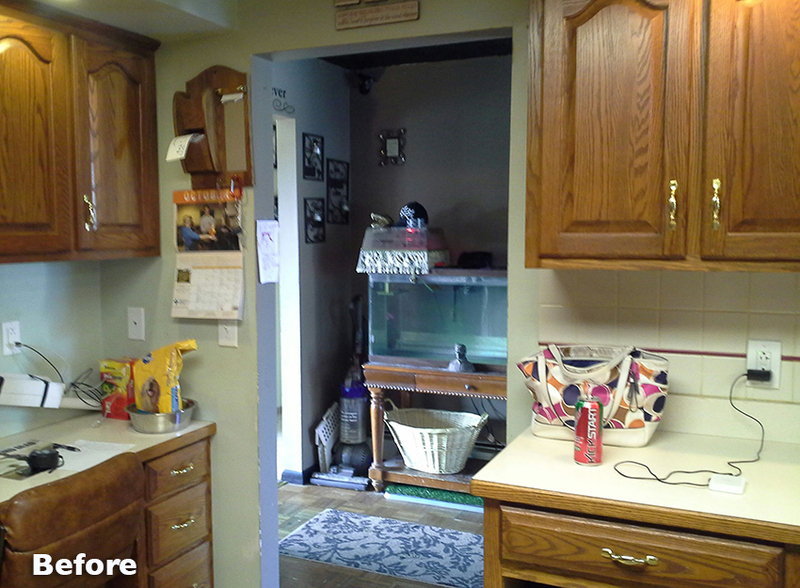 A "before" picture of this cluttered space, which is now used a as a pantry and storage cabinet for the kids. 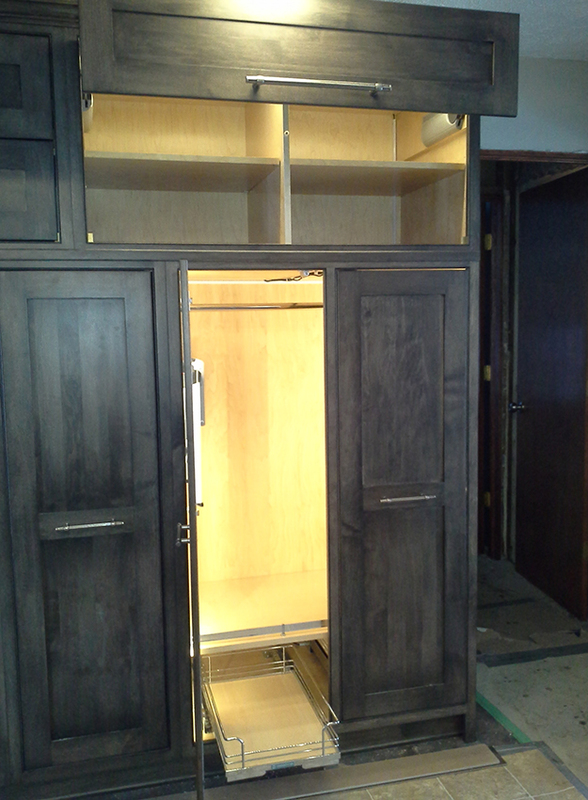 This bank of cabinets will be used to store the kids' jackets, shoes and backpacks. 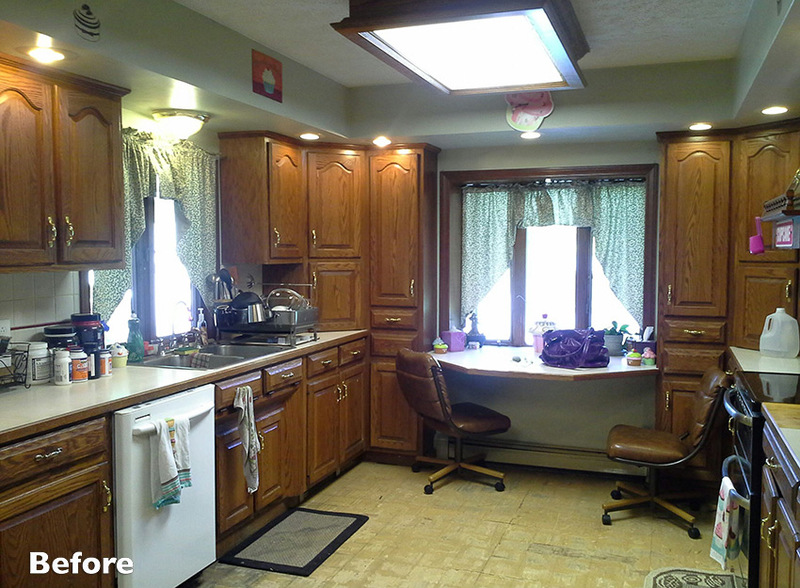 Even the family pets benefitted from this remodel. When Ellena meets with clients, she reviews a list of pre-prepared items to gauge interest and when she inquired about a space meant just for the dogs, Dillon was on board. 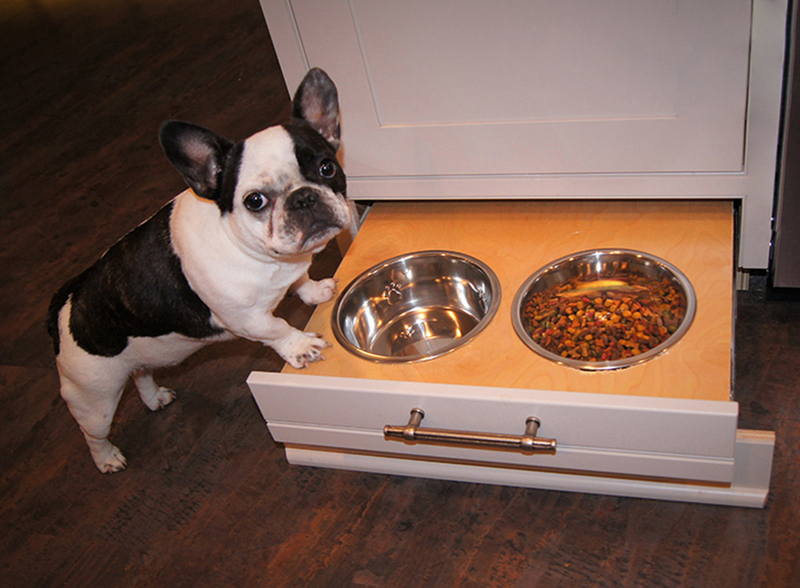 Ellena designed a drawer just for the dogs. This doggie drawer had two openings, one for water and one for food, that can be opened when it's time for meals or closed when not in use. When I spoke with Ellena she said, "The dog loved the space immediately. It was hers." Dotty even posed for a picture at her new feeding area. Dotty, one of the family dogs, was quite taken with her new doggie drawer. Besides all of the functional improvements to the kitchen, Dillon also wanted a more modern space than the previous kitchen. To acheive this, Ellena chose stone, a light gray painted finish for the kitchen cabinets and "Smoke on Maple," a darker stain, for the pantry and mudroom cabinets. A flat panel door was also chosen to give the kitchen a more clean and streamlined look. Lighting, which Ellena described to me as being Dillon's favorite addition, was added in nearly every cabinet, and under counter and even under the base cabinets, as well. I asked Ellena what Dillon's favorite part of the remodel was and she assured me that it was the lighting, even telling me that when the remodel was finished, Dillon had a blast opening all the doors and watching the lights in the cabinet come on. 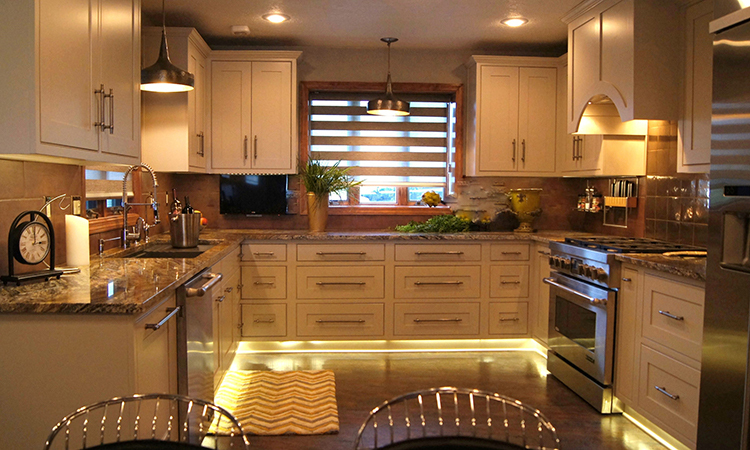 Dillon was enamored with the cabinet lighting in his newly remodeled kitchen. Many times with a kitchen remodel there are issues that need to be talked through, problems that arise and sometimes even changes that need to be made. I asked Ellena about this kitchen and she told me that everything went very smoothly. Ellena made the majority of the decisions and Dillon allowed her the freedom to do so. In the end, both the designer and the homeowner are quite pleased with the result. Dillon couldn't wait to get back into his kitchen and start cooking again, while Ellena spoke to me with excitement about the updated style of the kitchen, the added storage and just how much she enjoyed working with Dillon and his family. A win win.